"Multiplayer" is right on the main menu, and "Single Card" is on the multiplayer menu. The opening credits are a little long, but they're skippable. Download time is at (or a little faster than) average. While the menu options could be bigger, they're sufficient, responsive, and tapping where on the menu produces the desired effect. There are two control schemes in Polar Bowler: Touch Controls and Button Controls. The button controls are very easy to use, but not entirely accurate. The touch controls are extremely accurate, but not quite as easy to use (and you're forced to drag characters around by their butts (see DSSingleCard.com's Polar Bowler Hints). The physics in the game (how the pins fall, in this case) aren't entirely accurate, however, and it's sometimes a crap-shoot as to what to expect. It appears that the odd pin-falls can be either helpful or unhelpful, split (no pun intended) almost evenly both ways). It does seem, however, that this physics issue does leave an inordinately large number splits. There are six characters and seven lanes available in Polar Bowler (once everything's unlocked) and all of them are available via Single-Card Download. Unfortunately, aside from the look, a lane is a lane and a character is a character. There really isn't a difference other than their look. None. The game features some generic "wintery mood music" that is entirely unnecessary. Graphically, the game is rather poor. Visually, the game is pixelated, making the game look almost like a GameBoy Advance game, rather than a Nintendo DS game. While it's more than enough to be annoying, it's not so bad that it really intereferes with gameplay. Despite the bad graphics and sub-par physics, Polar Bowler is actually kind of fun. I had most of the unlockables available in under one hour of solo play through (the game's really not that deep), but it's a passable port of the 2004 computer game (and the 2005 McDonalds Monopoly version). The controls are doable without having to study them. The game is very much a multiplayer-centric game, and is playable by kids (both in controls and content), and could probably hold their attention for two to three games at a time. It's fat from a great game, but if there're kids around, playing it in small doses could be worth the $15 to $20 budget price it's currently selling at. Repair the bowling pin physics. Change the characters and lanes so that there is some unique feature to each of them. Add more characters and more lanes (12+ of each?) to the game. Let players choose the order they unlock characters/lanes. 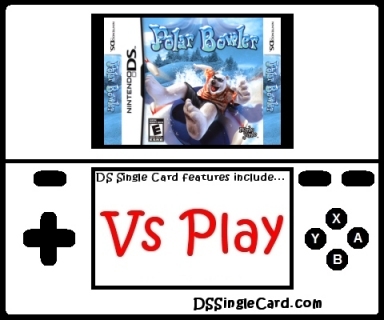 Click here to return to the DSSingleCard.com Polar Bowler profile.